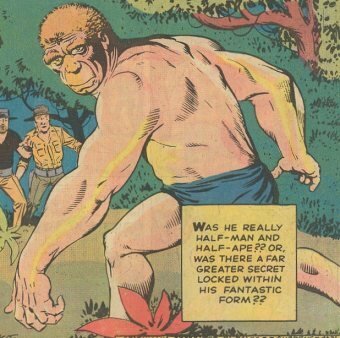 Powers/Abilities: The Missing Link demonstrated no special powers, but his hulking form may have been an indication of enhanced strength and durability. He possessed a time machine, and was well-versed in time travel. History: (Tales of Suspense I#31/4 (fb) - BTS) - The Missing Link came from a post-apocalyptic Earth ravaged by atomic war. He traveled back in time a few hundred years to gain insight into Earth's past. His time machine arrived on a deserted Pacific island. 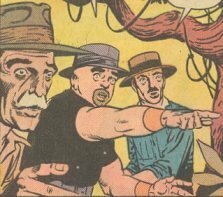 (Tales of Suspense I#31/4) - The Missing Link was discovered by three unnamed scientists, who assumed he was a prehistoric ancestor of mankind. The Missing Link was brought back to civilization, and for months the scientists attempted to communicate with him. He refused to talk, afraid to meddle in the past. Eventually the Missing Link broke down, and begged the scientists to take him back to his island home. Once there he revealed that he came from a future where humanity was greatly changed due to atomic war. He begged the scientists to find a way to end warfare, and then disappeared into his time machine. Comments: Created by unnamed writer and Steve Ditko. As with many 1950's and 1960's Marvel monster stories, this story is not confirmed as part of Earth-616 continuity, but there's nothing to exclude it either. Maybe this entire story took place on Earth-Missing Link, which was destined to be destroyed by the A-bomb. This story was reprinted in Where Monsters Dwell#36. Discovered uncharted Pacific island and the Missing Link. They tried for months to talk to the Missing Link, assuming his mind was too primitive to understand human language. They learned their error when the Missing Link begged to be returned to his island. They complied, and stood by as the Missing Link revealed Earth's potential future.